Water, water, water. Such an essential part of your camping or touring trip. It strikes us at Leisureshopdirect that, whilst camping, a fair bit of time is spent working out where the water is, filling up tanks, ferrying it back to your tent, van, motorhome or campervan and then ferrying the waste water away to the disposal. Which is why being kitted up with all the relevant water-related camping and campervan equipment and accessories is a must for easy, hassle-free camping and touring. On these pages you will find a range of caravan water carrier - be that fresh water carrriers for drinking and washing, water tanks or waste water carriers to dispose of the grey water you've already used. With a water carrier camping gets a great deal easier. One of the most exciting parts of camping or touring is setting up your camp itself. When we arrive on site, the proceedings often fall into a familiar but fun pattern... Number 1. Select a pitch. Number 2: Disembark the hot, sweaty car or motorhome. Number 3: Locate the water source and begin to stock pile the water supply you will need for your first well-deserved cuppa and beyond. We stock a range of fresh water carriers ideal for those who don't have an in-built tank or supply in either their caravan or motorhome. Some of the water carriers come, of course, with some very helpful features...as water is surprisingly heavy! Rollers will help you to guide your obtained water back to camp, whilst a handle makes it even easier on the back, shoulders and arms. We also stock storage bags for water carriers. 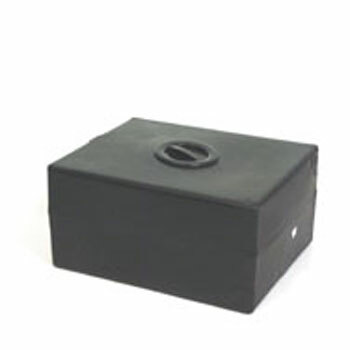 We also stock water tanks and the components and spare parts for water tanks, which can be mounted in your caravan, campervan or motorhome eiether vertically or horizontally. These come in a variety of sizes, from 70 litres upwards and are easy to fit. Why bust a gut when you're on holiday? 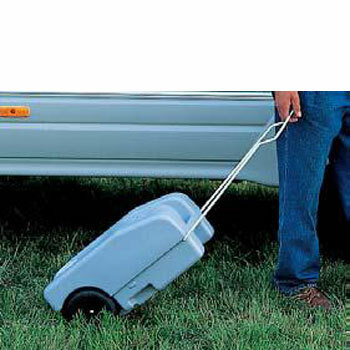 Whether you are transporting fresh water to your camping pitch or caravan or waste water from your 'van or camper, you could probably do it far more comfortably with the use of a Mini Trolley which is a wonderful partner to your caravan water carrier. 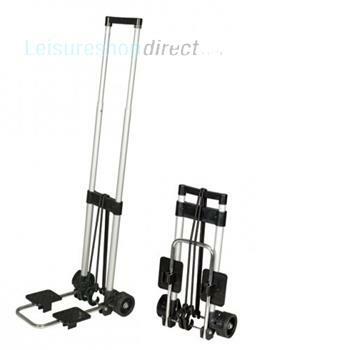 Cleverly, this little trolley folds down to save space when not in use. You can find a wide range of water-related products on Leisureshopdirect. For all of your plumbing needs check out our caravab plumbing section. And for those with more technical water supplies in their 'vans, have a look for a water pump for your motorhome or caravan and respective spares elsewhere on the site.